The Pop-up Shop has been getting a lot of press recently. Did it ever go away? Is a revision to enterprise philosophy under way? Asset management, both in the public and private sector is in flux. With revisionist thinking on collaboration and about public space utility and development? We think there is this paradigm shift, which can energise the social finance market. It will temper developments in the public space. This affects political mission, private capital movements and community outcome. We offer as evidence the three reports/ideas formulated by a diversity of organisations below. As crisp in their thinking as they are diverse. They are telling onlookers to change, at an opportune moment for our sector. Hogarth imagines the pop-up shop? Reading mainstream articles about this newly energised movement, we enjoyed revisiting the web site of www.appearhere.co.uk . We see it as a metaphor for a new retailing in the UK. We are a world away from the ’empty space’ temporary retail proposition of old. Gone are bare spaces, filled with less than high quality merchandise on a seasonal pressure sale basis. In comes a range of artisan producers, innovatory publishers and craft manufacturers. All intent on capitalising on short term, premium retail spaces. It should stir the imagination? The Appear Here concept achieves a number of aims for the burgeoning retailer. Firstly, you can use the site to scope spaces across the UK, and will be able to view more in the future. You can also see, upfront, the cost of occupying the space over your chosen period. If you are a community enterprise just at the planning stage this is important. Not being retail property specialists, but with a passion for your community manufactury, then knowing what the costs are likely to be, with support of the Appear Here team, could be a deal clincher for your project. We haven’t fully explored the booking conditions from the site yet, and cannot see other start-up costs like majority deposits that may be needed, but overall the presentation makes a telling offer for the 21st Century. Check out Appear Here today. We also liked and applaud The Plunkett Fondation’s attempts to vivify the community shop. They have recently published a new report Community Shops 2014 – A Better Form of Business. The Foundation’s main focus is on rural development. As with the initiative above, retailing and the opportunities it offers, are good in inner-city areas too. 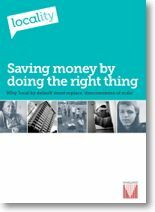 These include the principles of stock management, employment, volunteering, managing cash-flow and more. The mixture of skills and commitment adds human capital, not only to the shop, but also the community if done right. What can be gleaned for the Plunkett report is how a local shop can be a driver for community cohesion, a broad, beneficial identity and, because it is community owned, a wider sense of community ownership of place is also generated. Who cannot be proud of the area the shop they own exists within? 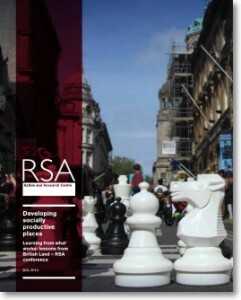 Yesterday The Royal Society for the Arts (RSA), in collaboration with British Land, published a new report about an emergent model to add value to public spaces by utilising a new admixture of co-operation and skills shared amongst local authority planners, developers, community groups and politicians. We were excited by the report, which contains recommendations for how private developers and public sector players can innovate and collaborate in new ways to get the maximum value from public spaces, whilst at the same time adding value to built assets. At the heart of the report is a lack of fear about profitability. But with a sense of urgency and innovation about how the public domain renovates and rebuilds from now on. The report tells us what should not done. As well as illustrating the new skills needed by key players in the development sector. It is a cogent and telling argument. It’s a timely report and you can read a short review, and find links to the conference that inspired the research, on conversationsEAST, the East of England Fellowship journal supporting the work of the RSA. The Institute of Public Policy Research (IPPR), is a centre-left think tank. 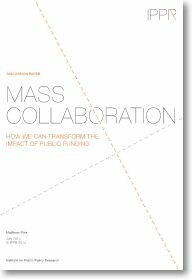 It recently published a paper called Mass Collaboration. Within the context of this brief article, the IPPR piece binds together some of the ideas expressed above. Taking a meta-narrative view of policy and practice. To see how to achieve change in the public arena. Moving to mass engagement within the socio-political structures that frame our society. The paper, authored by Matthew Pike, a serial social entrepreneur. He has connections to Unltd, Big Society Capital and the Social Investment Business. Matthew is the founder of www.resultsmark.org, a free reporting system for public services. Always worth checking out! The Pike thesis for change, that will will channel mass collaboration, is based upon five key principles. We give them below. “Invest in shared institutions that build social capital and engender supportive working relationships across sectors and hierarchies, such as teams of supporters around individuals, community anchor organisations, children’s centres, extended schools and more. Above all, invest in new ‘backbone organisations’ that can mobilise and organise whole-system change across localities. Understand what help people need in order to help themselves and discover the existing strengths within people and communities, through an immersive programme of listening and learning. Harness the new power of ‘big social data’ to turn public funding into a real-time process of action learning, understanding as much as possible about activities, outcomes and costs in an area to help design new systems that give people the help they need in a much smarter way. Provide funding, investment and support to test, grow and scale up what works better in a local context and cut what isn’t needed or is less effective. Work progressively to use new insight and evidence to help redesign the wider systems, rules and regulations that hamper local achievement”. The five could apply to the social finance sector, and the players operating in it. Innovation, change, consultation, system and process review, engagement with communities of interest. All are all defining characteristics of the Social Finance sector. The thematic glue to them, for us in the sector, is money. It’s accrual, its management and its dispensation. The Pikeian motif can layer upon the RSA paper, as well as across the innovatory approach of The Plunkett Foundation. In essence, we should talk to each other and ‘do things different’. A heady time to be in the vanguard of a new movement? To the Galleries of Justice in Nottingham this morning, 17th July 2014, for a massive double espresso shot of Social Finance. Two hours of concise advice, proven experience and excitement for a sector under change. Hosted by our own Roger Moors of SEEM, the assembled audience convened for coffee and muffins at 7.45am, more about the venue at the bottom of this article, all looking forward to a series of key speakers on expanding, developing and capitalising on our growing sector, courtesy of Big Society Capital. Cllr. McDonald was delighted to announce to the gathered social finance bankers and intermediaries that the City now had a new Nottingham Social Impact Fund. 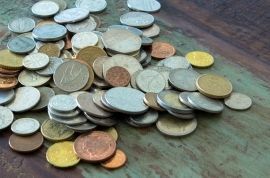 This new source of funding for the enterprising small business comprises a pot of £1 million pounds, which, argued Cllr. McDonald, coupled to a revised City Procurement Policy, would heavily lean the city towards a paradigm shift in its industrial base, as well as building on existing entrepreneurial energies in the city. A new fund is always welcome for the business sector, particularly at very good rates. You can discover more about the life and career of Cllr. McDonald here. Geetha began by offering the audience a classic definition of social investment, and underscored research that indicates, whilst societal problems will magnify and public sector funding will continue to diminish, it is the social sector, with its thirst for new forms of finance that will drive the sector forward in the next few years. Underscoring the role of Big Society Capital as a finance wholesaler, Geetha stressed the importance of intermediaries in process, and that BSC will be looking to exhaust its coffers on innovative projects, which give investors their money back, provide a return on that investment and achieve social impact and delivery. A clear presentation of roles and responsibilities in the sector, now and in the future. Discover Big Society Capital on-line here. Sam delivered a pacy and detailed analysis of the work of The Key Fund for his audience. Outlining the Fund’s history, but also encouraging intermediaries with the news of the quality of relationships the Fund enjoys, it’s flexibility and pace in moving from application to decision. A refreshing approach in a finance oriented sector, we believe. The Fund also illustrated how innovative and enterprising communities and individuals can be. Sam offered the audience examples of Fund development clients as diverse as a Therapeutic Comedy Training Academy, a Virtual Human Body for drug testing, community wind farms and and solar photo-voltaic energy installations on community buildings. The Key Fund deserves it’s key player status as a driver of fiscal energy for projects across the North of England. Discover The Key Fund on–line here. Peter gave the assembled audience a very informative over-view of Public Sector Mutual’s development. Organisations that move into the social business sector, ofen with existing customer bases and public sector ethics and philosophy. Reminding us that the sector could see demand for social finance rise to £500 million by 2015, Peter, nonetheless, did not shy away from some of the issues to be wrangled with in creating Mutuals in a local authority setting. Matt explained the heavyweight nature of The Big Lottery, and how it was looking to develop agile, relevant and timely funding solutions in the future, particularly to benefit the social finance sector. Working across three strategic layers the Fund is looking at how demand, intermediaries and the supply side of funding can all be tempered and flexed to respond to the needs of risk capital with a social mission at its centre. Richard gave us a ‘rally cry’ speech, moving across his own initiation into social business, after being a banker for twenty years and finding himself re-tailoring a hotel group in an area of social need. Raising £3 million pounds, only a year ago, using the social business’s innovative model of housing development, coupled to partnerships in the social enterprise sector to provide training and skills support for ex-offenders. So successful has Richard’s ministration been that profits are reported, funding need has been reined back, temporarily, and the business is set fair to exceed it’s targets of 15 property renovations undertaken per annum and with 150 clients supported through their training process into employment by the end of this five year bond period. Midlands Together, using a revision of the ‘Together’ model developed in Bristol, describes its work as property development with a heart. Real asset development, care for people and delivery of profits. We were inspired. We had our breakfast convocation at the Galleries of Justice in the Lace Market quarter of Nottingham. In the heart of the city’s creative area, this museum, educational service and charity offers a fascinating series of spaces for events. We met in the courtroom. You can see from the narrative above, all our star witnesses for the defense of Social Finance were sparkling. The verdict? Guilty of enthusiasm and expectation for the future. Evolve 2014, an annual event for the voluntary sector is almost upon us again. The gathering, organised by the NCVO, features a sector Summit, Marketplace and and a variety of Fringe events to occupy and interest everyone across the third sector. No matter what your role is with, or within, the voluntary sector, there is something at Evolve 2014 that is relevant to you and your organisation. It will help you look to the future, whatever the size, shape and mission of your organisation. The keynote morning events are delivered by Hilary Benn, Shadow Secretary of State for Communities and Local Government, as well as a session by Dawn Austwick, Chief Executive of The Big Lottery Fund. See the Summit agenda in detail here. incredibly, the economy of scale argument is still dominant in the Treasury, in government departments, in local councils and health bodies, and across the political spectrum. This is the myth that cutting costs will be achieved by combining public sector procurement into larger and larger contracts, by driving down unit costs through efficiencies of scale. Locality will be presenting their ideas as to how this dis-economy of scale can be subverted by a new methodology of delivery for the Public Sector. The recommendations are based upon original research by Professor John Seddon and the team at Vanguard Consulting. You can see the full Fringe programme here. Book your place at Evolve 2014 here. See you in London?